As many of you know, Father's Day is right around the corner, so I wanted to share with you a book that's perfect for the dad in your life. 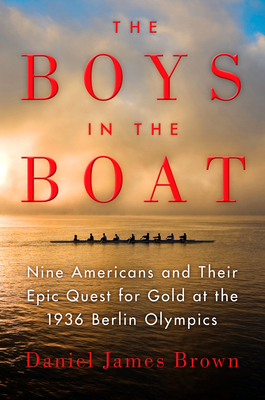 It's called THE BOYS IN THE BOAT: NINE AMERICANS AND THEIR EPIC QUEST FOR GOLD AT THE 1936 BERLIN OLYMPICS by Daniel James Brown, and it tells the story of the American rowing team that shocked the world in the 1936 Olympics. The book sounds amazing and I have a feeling that my dad (aka Booking Pap Pap) will enjoy it. In fact, he will be reading and reviewing this book in the very near future! To celebrate Father's Day, I am posting an essay written by Judy Willman, daughter of Joe Rantz, a member of the crew team. Mr. Rantz was the emotional heart of this story and I love the beautiful tribute that Ms. Willman wrote celebrating her love for this man. I think many women (and men!) will relate to her appreciation of her father. Often, I think, it is easy to look at a man and understand why he has become the wonderful father he is. Look at his parents. Look at his favorite uncle. Look at this amazing teacher, look at all that loving support, look at … look at … look at. And yet, some men become amazing fathers despite what appears to be a compete absence of loving role models. Sometimes it seems a wonder they survived at all. My dad, Joe Rantz, was a man like that. His mother died before he was 4, and his father sent him across the country to live with an aunt. Several years later, when his father remarried and brought him back home, his stepmother quickly tired of his presence and banished him from the house. Age 10 – banished. Age 11—banished again. For a few years there was an interlude, and he had a taste of home. But then the stepmother announced that she was leaving and taking my dad’s four younger half siblings, her own kids, with her. She told my grandfather, Harry, that he could stay or come, but he was not to bring Joe. Harry packed his things and left with her. So by the time Joe was 15 he was totally alone in the world. And it wasn’t just that he was alone. This was the bleak fall of 1929, the beginning of the Great Depression. Where would he find work? How would he finish school? What kind of person was he destined to become when all that he had so far learned about family and nurturing and love seemed not to apply to him? But my dad was not one to give up. He reached through the tangled mess that life had left him and cautiously pulled together the threads of whatever good things he experienced. As he continued to mature, he took what he could find that was helpful and wove it into a life philosophy. He took the love and dedication to family that he found in a local farmer who let him work for his dinners. He took the unflagging belief that my mother had in him through his high school and college years. He took the ferocious and unyielding pursuit of excellence that he found in his university crew coaches at the University of Washington. He took the gentle faith in others and the wisdom to reach for a higher power that he found in George Pocock, the university’s wise English boat builder. He took the bonds of brotherhood and the trust and willingness to sacrifice for others that he found in his crewmates. And he wove those together to make the shining fabric of the fatherhood he would don when he began to have children. He was my teacher, and my strongest advocate. I never had any doubt of his utmost faith in me. He loved his family. He taught us to reach for our dreams, but we knew that if we failed he would be there to catch us, dust us off, and help us start over again. He showed us how to love others and taught us to cherish life. And he left us with the sincere belief that the art of living a positive life was a lot like trying to find a four-leaf clover. The only time you don’t find it is when you stop looking. Sounds like one we would like! I can't imagine being on my own by age 15. Wow, what a sad childhood. I'm in awe of people who rise above an upbringing like that. This book sounds like one I'd love.